Alas, poor Life On Mars. Cancelled last week by ABC with only 17 episodes under its belt. There is an indication that the producers and writers will get a chance to finish the story properly so at least we won't be left hanging in mid-air wondering whether Sam actually manages to get back to 2008. Judging by this week's instalment it won't be any time soon and we'll be waiting until the very last episode on April 1st. This episode is very much about Sam trying to adjust to his situation, bookended by two relevant scenes. In the opening, Sam relates a dream of him wandering through a time frozen office to a police shrink, and the advice is to pretty much accept what's happened and try to move on. By the end of the episode, we see Sam doing just that, actually enjoying the company of his fellow officers in a bar whilst waiting for a fight to start on TV. The whole business about the Ali fight, whilst providing some nostalgia, was basically filler material. The trouble is that the filling in this particular sandwich isn't exactly much to write about. There's a very dull plot about a bomber targeting cops where it doesn't take Sherlock Holmes to figure out who planted them. 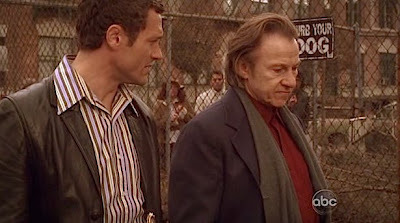 Twice the episode directly looks at the suspect and the second time Chris points out that he was at the first bombing. Duh! This is all interlinked with some torturous affair between a female politics professor, Pat Olsen, played rather excellently by The West Wing's Janel Moloney, and Rodney Slaven, the charismatic leader of a terrorist cell, the Weather Underground. When the husband shows up it's clear he's going to be important to the plot despite the fact that he's kept on the sidelines until the final ten minutes. It's a pity that the entire plot resolves around his quick confession in the interview room as until then the thriller elements of the story were quite interesting and I was half expecting the dead terrorist leader to miraculously appear to spice things up. But he didn't. The husband is so upset over these revelations he leaps into a car that's been rigged to explode to kill Gene. How handy. However, we were given a bit more of Gene's murky past and his association with the cops in the Red Squad, a mysterious gang of cops who allegedly were more vigilante than upholders of the law. I enjoyed getting more background on Gene and Harvey was particularly strong in the episode and the interrogation scenes suggested a nice chemistry between him and Jason O'Mara. Loved the in-joke of the first bombing located at a bar called Glenisters. 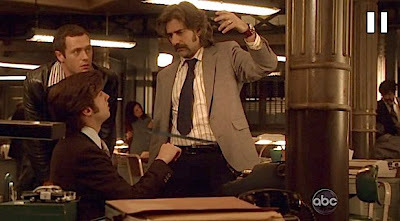 Sam fares particularly badly in this episode because they simply take away all his obsessions and turn him into 'good' cop next to Gene's 'bad' cop. The minute he decides that assimilation is the best way forward the character becomes rather boring. The only interesting thing to note was the footage of terrorist leader Rodney Slaven admonishing Sam to 'save the pigs' which didn't really make much sense and seemed a half-hearted attempt to reassure us that Sam is still out of kilter with 1973. In the end it was scripting by numbers and a very forgettable plot that added nothing of any significance to the mythos. A waste of a particularly good cast this week too. Let's hope the last four episodes provide a proper swan song for the series.